Whether you're dabbling with altered states of consciousness, suffering from Awareness during Sleep Paralysis (ASP), or trying to achieve OBEs, it's easy to succumb to fear, whether it's fear of the unknown, fear of death, fear of getting lost, or fear of being possessed. Many people ask me: "I can get this far (the vibrations or whatever), but I always get scared at the last minute, chicken out, and abort the OBE. How can I get beyond the fear?" Not only can you get beyond the fear, you can actually turn the tables and harness your fear to actually induce OBEs. Let me explain. Defense #1: Fear is a bodily thing, not a spirit thing. So fear is natural, and has its place in human evolution, but since it's a function of the physical body, it doesn't need to apply to out-of-body experiences. Your physical body can't be harmed by anything you encounter in an OBE. You're just too used to thinking in terms of a body image. So the more you tell yourself there's nothing to be afraid of, the less scary things you'll encounter. Likewise, nothing in the OBE state can harm your non-physical body. It is probably misleading to say it's indestructible like many books in the genre. It probably more accurate to say it doesn't even really exist. What you perceive as an "astral body" is just a "body image" ingrained into your subconscious. You're conditioned from physical life to think in terms of a body-image that does the acting. In reality, this is just a device for a much greater reality that cannot be harmed. When I first started doing this, I was scared too. I wrote about it in my first book in Chapter 8 - Overcoming Fear. You can't really overcome fear (which is an emotion) with intellect (which is not), but you can come close by rationalizing them. In other words, you can use your intellect to override your emotions, and move forward anyway. This is a tough one, and hard to get around. In an OBE, I guarantee you will encounter the unknown, the unexpected, and the unusual. With each new OBE, you will experience these things, and as you do, the unknowns become knowns. As you explore, you'll become more and more familiar with the people, places and things that are "out there." Gradually, you'll tell yourself, "That wasn't so bad. It's not scary out there at all." And if you do encounter something scary (like sudden scary faces jumping at you) and it sends you back to your body, you'll gain more confidence: Tell yourself, "See? I got through it. It was a little scary, but no harm came of it." In other words, it gets easier with time. This is another tough one. Obviously, if anyone died during an OBE, they never got the chance to give us any warnings, right? So in a way, you just have to take this as a matter of trust until you gain confidence. Take comfort in the fact that thousands of people have reported thousands of OBEs without having died. No harm has ever come to me in the 37 years I've been doing this. When you're out of body, it's natural to wonder if someone--or something--can enter your vacated body. I had a friend once named Lisa who told me about an OBE in which she returned to her body to find the spirit of a woman unsuccessfully trying to animate it. She got angry, yelled at the spirit, and the spirit fled. The bottom line is that a portion of the subconscious still keeps tabs on the physical body and makes sure it's alright. For example, if there's any perceived threat, like if your phone rings, you'll be slammed back to your body. I believe we have a "Higher Self" that's invested a great deal of time and energy to produce your physical body for purposes of spiritual growth, so it's not going to give it up that easily. This fear isn't as hard to deal with as the others. Yes, in an OBE, you can get "lost" and have absolutely no idea where you are, but you will always return to your physical body. Again, your "Higher Self" is not going to just abandon it. In one of Richard Bach's books, he talked about wanting to just induce an OBE when he felt like leaving this Earthly existence, but it doesn't work that way. In my opinion, if you're still here in this physical reality, you're going to keep waking up in this physical body as long as you still have spiritual lessons to learn. No matter how far you wander, eventually, you'll just lose consciousness and wake up in your physical body again. Defense #3: Understanding / Knowledge lessens fear. You can try to rationalize away your fears all day long, but in the end, only experience trumps fear. You can ease into this at first by using someone else's experiences. You can read books about other people's OBEs and find out if they're generally scary or not. Having read almost every OBE book out there, I know the general consensus is that the vast majority of OBEs are wonderful, pleasant, and not scary at all. Yes, it may be scary to face the unknown. You don't realize how "real" it can be until you're actually standing there, facing the situation. You can try to steel yourself and say "I'm going to be brave," but your situation doesn't hit home until you're really there. But each time you do it, your fear becomes less and less. Someone famous once said that bravery is not being unafraid. Bravery is being scared and doing it anyway. You don't let your fear stop you. And with an OBE, you can do that gradually. So when you're in that situation, tell yourself "I'll just stick around a few more minutes and see what happens. If I see anything scary, I can always bail / abort." Confronting fears is a lot like getting into a lake or swimming pool. If you start by dipping one toe and carefully submerge each body part, it will be a slow torture until you're completely wet. But if you jump in all at once, there will be some initial shock, but you'll resolve the situation much quicker, with less overall discomfort. It's the same with fears. It's best to confront your fears directly. I used to be terrified of bears. I used to have nightmares several times a week about bears chasing me. My fear got better when I went to Africa in 2002 and found other much more dangerous animals to worry about; bears seemed trivial by comparison. Still the nightmares persisted. 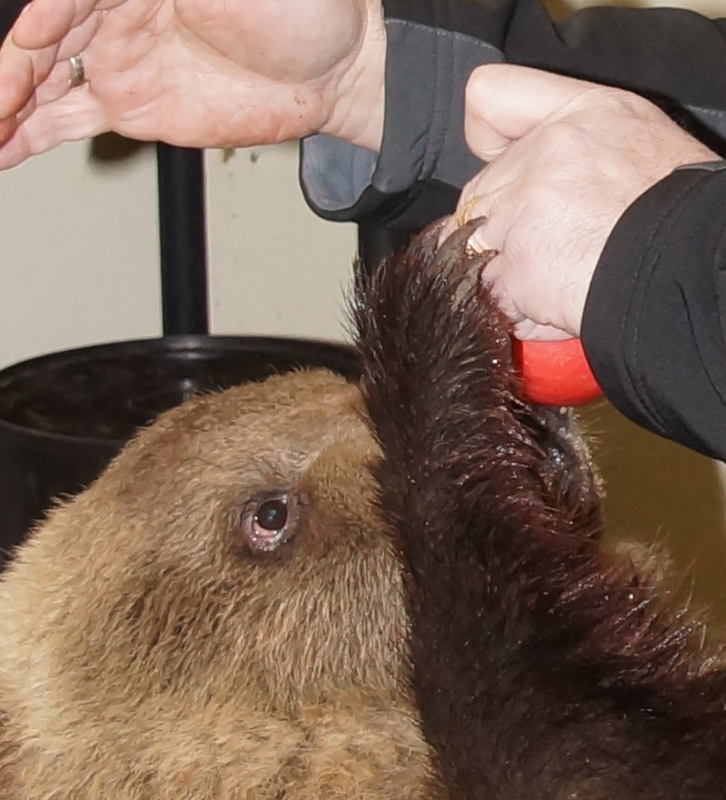 Then one day in 2014, I had the opportunity to hand-feed an un-caged grizzly bear cub. The cub was about ten months old, and 150 pounds (68 kg) of dense muscle, and very hungry. Although it was small, it had huge white fangs capable of ripping me to pieces. Its jaws were so powerful that the apples we fed it literally exploded in its mouth with the force. It had long sharp claws that could have cut me wide open. It wanted food, it was not to be bargained with, and it was powerful enough to get its way. Still, I forced myself to do it, my heart pounding the whole time. The whole event was so incredible and surreal that a professional magazine paid me to publish the story. Here are two photos. 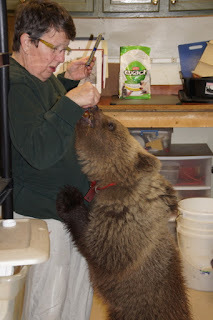 The photo on the left is another volunteer, Marilyn, who also helped feed the grizzly some grapes. I was very worried about poor Marilyn as the bear started being aggressive with her, nearly climbing her torso. Lucky for her, we managed to distract him with other food. The photo on the right is the grizzly bear's claws on my hand, reaching for an apple. After doing this, my nightmares about bears pretty much stopped. I've only had one since. Maybe I'll repost the original version of the magazine article in my blog sometime. Even if you don't resolve all your fears, you can turn the tables on it. You can actually harness your fear to induce OBEs. Let me explain. In most cases, the fear is actually causing the ASP in the first place. They're so scared it's going to happen again that it does. ASP is just a breath away from OBE. Keep in mind (or should I say "bear" in mind!) it's easy to turn an episode of ASP into an OBE simply by closing your eyes and pushing forward with your consciousness as hard as you can, as if you're walking underwater, while imagining that you're moving forward. In most cases, you can break the cycle simply by learning to not be afraid. So if you want to get rid of ASP, conquer your fear. But if you want to have more OBEs, harness that fear: realize that your fear is actually a good thing because it can induce the ASP state, and from the ASP state you can get directly to the OBE state. Instead of being afraid, you can take the attitude of "Ha! I know what's going on! I'm just in the ASP state!" and take control of the situation. I also use fear as a trigger device to induce lucid dreams, and transition from there to the OBE state. In other words, I've conditioned myself to question whether I'm dreaming any time I experience any kind of fear. If I feel afraid for any reason whatsoever, it probably means I'm dreaming. I think, "Wait a minute. If I'm afraid, so this might be a dream!" When I do the reality check, I often find that I am dreaming and become fully lucid. Once lucid, I turn the lucid dream into an obe. So condition yourself to question reality whenever you're afraid, especially if you have frequent nightmares. There's another fear generator called the "Guardian on the Threshold" that can throw scary (or at least very concerning) things your way. It is, in fact, your own subconscious mind, and can be safely disregarded. But this article is too long already, so that's another topic for another day. If you do all these things, it will lessen the grip of fear, and eventually the fear goes away.